After the game Quenneville then had this to say about Bickell when asked why he benched him. He’s right, too. The Blackhawks do need more, it’s just Quenneville is looking for more from the wrong person. I did not like the deal the Blackhawks signed Bickell to over the summer. Bickell was fantastic in the playoffs, and played a huge role in bringing home another Stanley Cup, but he was still Bryan Bickell. He was still the same guy who is useful to a team, but is by no means irreplaceable. So when the Hawks decided to give him $4 million a year for the next four season it seemed like a bad decision to me. A decision based more on the Stanley Cup afterglow than actual hockey sense. Bickell has since repaid the Blackhawks by playing like Bryan Bickell. He’s had a terrible January, sure, as he’s scored one goal with no assists in 11 games this month while barely seeing the ice as he works his way out of Quenneville’s doghouse. You can’t bench Jonathan Toews or Patrick Kane. 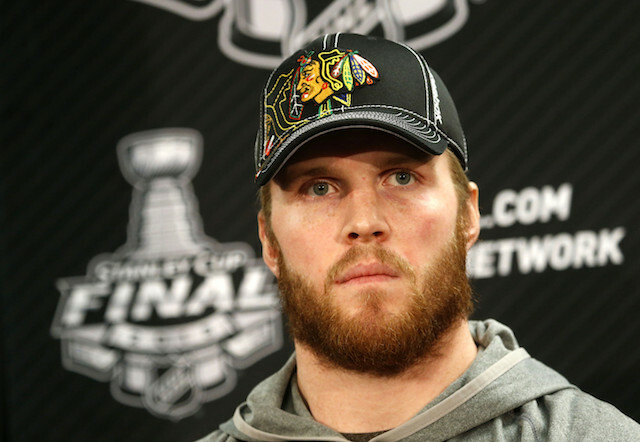 You can’t bench Duncan Keith or Brent Seabrook. It doesn’t matter that these four cornerstones of the franchise are playing poorly as well. In 12 games this month the Blackhawks have gone 4-3-5 for 13 points. That’s 1.08 points per game, which is well below the average of 1.5 points per game the Hawks had averaged over the first three months of the season. And this drop off isn’t because of Bryan Bickell, it’s been a team effort. There’s the play of Corey Crawford, which has been shaky at best since he returned from injury. There’s been Brent Seabrook who has seemed a “step” slow all season long, blowing defensive assignments which have led to goals. And then there’s been the lack of production of both Jonathan Toews and Patrick Kane as of late. The Blackhawks should be able to survive cold streaks from Bickell, it’s the ones from Kane and Toews that are much harder to handle. In 12 games this month Toews and Kane have combined for three goals and 12 assists. Not terrible, but not exactly what you want from your two best players. The numbers are also a bit misleading. While Toews has two goals and seven assists in January, seven of his points came in the first six games of the month. In the last six games — in which the Hawks have gone 2-2-2 — Toews has two assists, and that’s it. Kane, meanwhile, went 11 games without registering a goal before scoring against Minnesota on Thursday. In 12 January games he’s found himself without a goal or assist in eight of them. Personally I don’t think Kane is playing poorly, he’s just run into some terrible luck. He’s had plenty of great chances that he’s either hitting the post or the goalie is making a fantastic save. Still, no matter the reasons behind why Toews and Kane aren’t producing — honestly, I love hockey, but I’d leave the analysis like that to others who know the inner workings of the game much better than I do — it all boils down to the fact that they just aren’t. At least, not at the level we’ve grown accustomed to over the years. They will begin producing again, and when they do things will turn around. When they do maybe Quenneville will give all the credit to Bryan Bickell, though I doubt it. This entry was posted in Chicago Blackhawks and tagged Brent Seabrook, Bryan Bickell, Corey Crawford, Duncan Keith, Joel Quenneville, Jonathan Toews, Patrick Kane by Tom Fornelli. Bookmark the permalink.